No. 1019: It is very difficult to be a preacher, and be faithful to that call, and the word of God! It is very difficult to be a preacher, and be faithful to that call, and the word of God! Image of Bjarne Staalstrøm in Drammen. I have never doubted the call and fittings myself to be a preacher of the Word, though I most of my adult life has not been a full-time minister. But had a common civil works. This has had and has its advantages and disadvantages. The first time I remember I got confirmation on my preacher calling! I have received very many other confirmations, but this was probably one of the first or the first time I got vindication that I had a preacher calling. Being a preacher of the Word. I was relatively nyfrelst and nyåndsdøpt. The witness then in the church on the basis of God's word. When would the one who was preaching when the church right then to have a little conversation with me. I went politely away, it was Bjarne Staalstrøm in Drammen. He said these freely reproduced: "Young man, you are probably a man God would use, I am convinced that you have a calling to preach!" I said something like this: "How can you believe this?" He said something like this: "When you testified, I noticed you had a light on and the word of God that was not from yourself, but you saw what was in the text." I said something like thank you, this was lovely and good to hear. How could I have still yet. It is very difficult and challenging to be a preacher of the Word, especially today where the liberal and secular currents within its Christianity is so very big and strong! You are in a relationship, be it a Lutheran, free evangelical, Pentecostal / charismatic or whatever it is. God comes close to you, you get a new light on things you can not have had before. A new truth from God's word. You know that traditionally they have not accepted this within its this movement or denomination, what then? You are preaching in a context or Trustees in a ward! Imagine, you are opposed to remarriage, you know that the word of God says in the New Testament does not open up for this. You going to a church - you're brand new there. You are greeted by Pastor there and he tells you is re-married there. God has laid it on your heart before you came there to speak against remarriage, then what? You have been part of a movement that has not accepted the female elders and pastors. Imagine, you are well established in a context. Your father was with there, all relatives, you are a preacher there. So things are still happening, new people come. Good but liberal, not with view of what God's word says, but what can win the greatest support. You feel that you have become a stranger in your own movement, but all relatives and entourage are with there. What do you do? People understand or will not understand how hard there is standing in a Christian context and be a preacher of the Word, not least today! You are caught in the middle. And many times it's almost impossible to figure out what is right, purely human perspective. But the word of God encourages us all to stand firm, and ask God for wisdom in such situations and contexts. James 1 5 But if any of you lack wisdom, pray to God, that giveth to all men liberally, and upbraideth not; and it shall be given him. 6 But let him ask in faith, nothing wavering; for he who doubts is like a wave of the sea driven and tossed by the wind. 7 For let not that man think that he shall receive anything from the Lord, 8 A double minded man is unstable in all his ways. My rallying call is rather to break all ties, standing before God, one must stand alone. Everything will be for the one who goes with God and trust in God's word, it is my experience. And it has millions experienced before - and I'm sure it will be the experience for all who come too! No. 1018: Evangelist Finn Arne Lauvås would have drowned me when he had the chance, he said, when he baptized me. Is it okay that preach to others down? 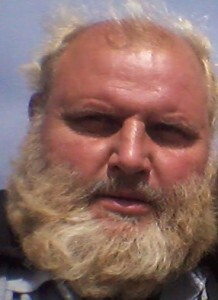 Evangelist Finn Arne Lauvås would have drowned me when he had the chance, he said, when he baptized me. Is it okay that preach to others down? 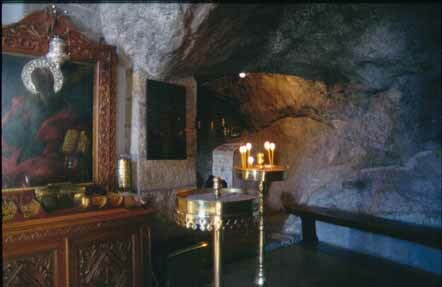 Photo inside the cave on Patmos. Some lamps and icons reminds us that this is an Orthodox sanctuary, but it is not difficult to feel the weight of history from the time John was on this island. Many legends about Johannes found on Patmos. Here inside the cave there is a stone where one thinks that John Secretary Prokoros sat and wrote. Legend has it that a large crack in the firmament of the cave came in that mountain cracked when Jesus appeared and said "I am the Alpha and Omega." Where the Apostle John received the message to the seven churches. One of the messages I think applies to us as believers in the end time more than anything else, it is the Laodicean church that ia got this: "Wherefore I give you the advice that you buy from me gold refined by fire, that thou mayest be rich; and white clothes that you can dress up with and hide your shameful disgrace, and salve to put on your eyes as you can see. " I will use what I have written recently about the Heavenly blog that Evangelist Finn Arne Lauvås would if he had shown better drowned by then he baptized me. This came after I went against his new teaching which Israel as a people and nation has no advantage and further significance of the prophetic word and God. It's okay that we were vigorously disagree, but to engage with as I see it hersketeknikk and desire death of another brother, this is fine for preachers and those who have responsibility in the congregation? It never happens anything with these bad shepherds who press down and make fun with others? Or it might now be a change in the church of God that there will be consequences for acting like this here mentioned and similarly? What scripture says about the bad shepherds? Or to turn on the whole, it is very difficult to be a preacher of the Word today! What I mean by that? Well, think hard about. Here one should preach a message to people who also will reward you! IT IS NOT EASY! People today, the congregation will have that itch in your ear! This is actually stated philosophy of the Apostle Paul, that in the end, people will. Also in the church become so perverted and corrupted, that the conscience they have thrown in by. They will have that itch in your ear and it will be difficult times. In such a spiritual and moral condition is very, very hard to be faithful to that call, both his and faith, receive the word. I will also defend such preachers as Finn Arne Lauvås and others who have failed, it is not easy to stand up in this time when spiritual battle is so hard! I know from my own experience, I had not had a normal civil job. My wife is working so we have zero depending on the support of a single person. I am privileged, we are not dependent on support from and some! But what of the publishers who are dependent on financial support from a backslidden people? They must if they want to proclaim and live the Gospel preach what the people want, that's obvious and unfortunately a fact that such is so. But it is necessary to behave simple and poor as Finn Arne did? For me it was to be baptized in water and Spirit one of the loveliest and most important thing I have learned in the Christian life. It is especially sad that the person God used to lead me through this act so simple and poor. But unfortunately it is here we come today that the church is characterized and controlled by the bad shepherds who we ia found in Ezekiel's discussion of and about the shepherds of God's church. Ezekiel 34 1 And the word of Jehovah came to me, saying: 2 Son Prophesy against the shepherds of Israel, prophesy and say to them, to the shepherds: Thus saith the Lord GOD: Woe to the shepherds of Israel who feed themselves! Is not shepherds feed the sheep? 3 You eat the fat, and with woolly clothe yourselves fatness slaughter; flock feed not. 4 The weak you have not strengthened, and the sick have ye not healed, and the broken have not bound, and driven away have not brought back, and the lost have not pillaged, but with violence and with cruelty have ye ruled over them. 5 And thus they were scattered, because they have no shepherd had; they became food for all the beasts of the field, and were scattered. 6 My sheep wandered through all the mountains and on every high hill and across the country are my sheep scattered; no one asks and no one looking after them. 7 Therefore hear ye the word, I shepherds! 8 As I live, saith the Lord God, surely because my flock became a prey, and became food for all the wild beasts, because there was no shepherd, and my shepherds asked not after my flock, but shepherds fed themselves, and fed not my flock - 9 therefore, ye shepherds, hear the word of Yahweh! 10 Thus saith the Lord God: Behold, I am against the shepherds and will require my sheep at their hand and cause them to cease feeding the sheep, so shepherds shall no more feed themselves, and I will deliver my sheep out of their mouths, lest it should be food for them. 11 For thus saith the Lord God: Behold, I am and will ask after my flock and look to it. 12 Even as a shepherd his flock in the day that he is among his scattered sheep, so I will look to my sheep and rescue them from all the places where they are scattered on a day of clouds and thick darkness. 13 And I will bring them out from the peoples and gather them from the countries and bring them into their own land, and I will feed them upon the mountains of Israel, in the valleys and in all places in the country where they live. 14 On a good pasture will I feed them, the high mountains of Israel shall their fold be; where they shall rest on a good fold, and in a fat pasture shall they feed upon the mountains of Israel. 15 I will feed my flock, and let it rest, says the Lord God. 16 The lost I will seek, and the driven away bring back, and the broken I will bind up, and the sick I strengthen. But the fat and the strong I will destroy; I will feed them what is right. 17 And I, my flock, thus saith the Lord God: Behold, I judge between sheep and sheep, between rams and goats. 18 Is not it enough that I get the good pasture, but you must tread down the rest of your pasture with your feet? Is not it enough to have drunk of the clear waters, ye must foul the residue with your feet? 19 And my sheep - they eat that which is trodden with your feet, and drink what you have fouled with your feet? 20 Thus saith the Lord God, so to them: Behold, I am and will judge between the fat sheep and the lean getting. 21 Because I encounter all the diseased with side and shoulder, and pushed with your horns, till ye have scattered them and driven them out, 22 so will I save my flock, and they shall no more be a prey, and I will judge between receive and receive. 23 And I will set up one shepherd over them, and he shall feed them - My servant David; he shall feed them, he shall be their shepherd. / 24 And I the Lord will be their God, and my servant David shall be prince among them; I the Lord have spoken. 25 And I will make a covenant of peace with them and eradicate wild animals of the land, and they shall dwell safely in the wilderness and sleep in the woods. 26 And I will make them and the places around my hill a blessing; I will send rain at the proper time; of blessing rain flows should be. 27 Markens trees will yield its fruit, and the earth shall yield her increase, and they shall dwell safely in their land, and they shall know that I am the Lord, when I break the bars of their yoke and delivered them from the hand which kept them in servitude. 28 And they shall no more be a prey to the nations, and the wild animals will not eat them; they shall dwell safely, and none shall make them afraid. 29 And I will a plant grow up for them, which shall be to them a renown, and they shall no more consumed with hunger in the land, neither bear the shame. 30 And they shall know that I the Lord their God am with them, and that they, the house of Israel, are my people, saith the Lord God. 31 And I, my sheep, the sheep of my pasture, are men; I am your God, saith the Lord God. I take the whole chapter, as it is as comprehensive and extensive. But there is no doubt that this is many times also reality and a fact that there are few and no good shepherds today in the church. The baker out and shows no care for the sheep. They fail to seek out the stray, those who contact pushes those in by. And those unable longer to go for his own "machine" is left to itself, to die spiritually. And should anyone think to criticize and say what is the truth, then they'll be shunned and ostracized, if one also be warned against. Then it is not easy for God to use His church to be a rescue station for the exhausted and bewildered people that there are so many of today! Unfortunately, the church has come into such poor condition, it is a pity both preacher and sheep. What is needed? I takes me to finish what needs to from my commentaries from Revelation to the church of Laodicea, which is a message to the end-time church rather than someone else. The message to the church at Laodicea for my commentaries Revelation, I take only the end showing the solution out of it all. Have explained enough what condition and states it is. Revelation 3. 18 Therefore, I give you the advice that you buy from me gold refined by fire, that thou mayest be rich; and white clothes that you can dress up with and hide your shameful disgrace, and salve to put on your eyes your, so you can see. But an offer of restitution and to return to him stood unchanged even in this congregation. But then they had to get in a tried and persevering faith. White clothes are not to be defiled by sin and filth of the world. Furthermore, the offer and demand of the heart opplate eyes. That's really where we all need to come back to! Efes. 1. 17 I pray that our Lord Jesus Christ, the glorious Father, may let you the Spirit of wisdom and revelation, so that you learn to know God. 18 May he give their heart eye light, so you understand the hope he has called you, the riches of his glorious inheritance of the saints, 19 and how very His power is with us who believe. With this power and strength 20 he traveled Christ from the dead and seated him at his right hand in heaven, 21 over all principalities and powers, above all the majesty and dominion, and every name that is named, not only in this world, but also in the coming. 22 Everything under his feet, and him the head over all things, he has given to the church, 23 which is the Body of Christ, the fullness of him who fills all in all. To pray this prayer every day will be crucial in any life. 19 All that I have cherished them rebuke and chasten me. Let there be serious and repent! This is done in love? How is the love we read about in 1 Corinthians. 13? v. 6 Love does not delight in evil but rejoices in the truth. It had to be serious and one must take the advice to heart that the message concerned them. 20 Behold, I stand at the door and knock. If anyone hears my voice and opens the door, I will come in to him and will sup with him, and he with me. The whole congregation was very difficult to accept the message because they wanted it that scratched them in your ear. But it was, if possible, some understand the church that would take it to heart? They would experience the close fellowship and communion with Jesus all over again. 21 He who overcomes, to him I will sit with me in my throne, even as I also overcame and sat down with my Father on his throne. Again addressing the Lord himself to the victorious and who want to follow him. Once saved, always saved is one of Satan's lies. Salvation is something one should also grow in and take care of. For he who overcomes one should get the same position and position himself. We will sit with Christ in the heavens. Efes. 2. 6 In Christ Jesus he raised us up from death with him and put us in heaven with him. 22 Whoever has ears, let them hear what the Spirit says to the churches! For the last time, and to the church in Philadelphia as to all other believers through time, whoever has ears he \ she hear what Jesus says to the church and the individual! Seven angels ie seven messengers the angels means, would bring the letters to their respective churches. Revelation. 1: 11.20. This was human messengers who were not only ambassadors but also Talkers of the message at each location. Revelation. 1: 3. Matt. 11:10. Historically happened approx 90 AD Seven churches were read to their respective sending letters. Since these send letters been read all over the world and become the spiritual lesson for many. Room. 15: 4. But sending letters has another meaning. For Jesus Christ said to John: "Write what you saw, what is now and what will come after this, and mystery of the seven stars that you saw in my right hand, and the seven gullysestaker: The seven stars are the angels of the seven churches: and the seven candlesticks are seven churches. " Revelation. 1: 19-20. Johannes' Revelation is a prophetic book. Revelation. 10:19 p.m.. It gives prophetic view of Daniel 70. åruke ie the last seven years of this age. Revelation. 6: 1-19: 21. Entire åruken described through the seven seals, seven trumpets and seven bowls anger. Seven-figure stands in Scripture for wholeness and completion. 1.Mos. 2: 2. But sjutallet is used by John is not just about what is to come, but also about what is now. Apostle are asked to write to seven churches, yet there were several on the mainland of Asia Minor. It was at least congregations also in Troas, Colosse and Hierapolis. Acts. 20: 6-7. Kol. 1: 2. 4:13. The seven churches were consecutively in a circular shape. The Apostle saw the seven parishes that seven gullysestaker as seven stars brought tidings to. The whole thing was a nightly scene in character form told about the church's mission in a dark world. Revelation. 1: 1. Fil. 2: 15-16. When just seven churches mentioned, it is a sign of a prophetic panorama over the whole church on earth. It is the secret that John was revealed. Such prophetic panorama we also meet in 3.Mos. 23 with mention of the seventh day and the seven feasts, in Dan. 9 with mention of 70 x 7 years and in Matt. 13 with mention of the seven parables. In all send letters comes a commandment to hear the Spirit's voice and a promise to those who overcome. In the first three sending letters come decree before lifting. Revelation. 2: 07.11.17. But in the last four send letters comes the promise before the decree. Revelation. 2: 28-29. 3: 5-6.12-13.21-22. In the last four send letters, we also hear that Jesus is coming again. Revelation. 2:25. 3: 03.11.21. This buildup of sending letters testify various periods in church history. This has become clearer throughout history. This principle maintained the Jesus to Peter: "What I do thou knowest not now, but you will understand later." Joh. 13: 7. This principle was also the prophet Daniel hear of an angel. Dan. 12: 4.9. Send letter to Ephesus speaks of the church the first time from ca. 30-100 AD Revelation. 2: 1-7. It began with a fervent love that diminished. Hebrews is a testimony to this. Heb. 10. 24 Let us be concerned for each other, so we provoke each other to love and good deeds. 25 And let us not keep us neglect our church meetings, as some people do. Let us encourage one another, so much more as you see the day approaching. Likewise message to the church at Ephesus. Obvious. 2. 4 But I have this against you, that you have left your first love. Here we see that even among the early Christians did apostasy apply. But the church was still desirable, as the Ephesus means. Send Letter to Smyrna speaks of the church's time of approx 100-313 AD with strong persecution of Christians in the Roman Empire. Revelation. 2: 8-11. Jesus' words in Matt. 5:10 was achieved in this period: "Blessed are they which are persecuted for righteousness' sake, for the kingdom of heaven is theirs." In a time of persecution was needed myrrh, which was used to relieve pain. Mark. 3:23 p.m.. Smyrna means myrrh. Send Letter to Pergamum speaks about the church's time of approx 312-606 AD Revelation. 2: 12-17. In 312 happened Constantine's conversion to Christianity. Persecution period was followed by a forførelsestid, where the church married a state. Pergamum means icecreams marriage. One was ended in the Jak. 4: 4 warned against: "Whoever wants to be friend of the world becomes an enemy of God." Send Letter to Thyatira speaks about the church's time from 606 AD Jesus returns. Revelation. 2: 18-29. In 606 AD was Bishop of Rome Bonifacius elected universal bishop. With this came the papacy in function. A worldwide church with Rome center has since deceived many with the introduction of pagan customs in Christianity. Revelation. 17: 4. Noteworthy is that Thyatira means repeated sacrifice. Send Letter to Sardis speaks of the church's time from 1517 to the Second Coming. Revelation. 3: 1-6. In 1517 Martin Luther hung the 95 theses on the church door in Wittenberg. With that started the Reformation, which also Calvin and Zwingly were pioneers for. Scripture alone as was stressed, led to spiritual awakening. But eventually many nominal Christians. Noteworthy is that the Sardis means those who escaped. Send Letter to Filadelfia speaks about the church's time of approx 1750 to the Second Coming. Revelation. 3: 7-13. John Wesley and George Whitefield was voted revival tool and was succeeded by William Carey as the modern missionary father. An open door to the mission was in this time and in the wake of this were New Testament churches arranged characterized by brotherly love. Philadelphia means brotherly love. Send Letter to Laodicea speaks of the church's time of approx 1900 to the Second Coming. Revelation. 3: 14-22. In that time, democracy mentality been prominent instead that Christ has gained control his congregation. Noteworthy is that Laodicea means democracy. The result of this has been much complacency and lukewarmness. Send letters reveal that three types congregation got characterize the church's early days, while four church types will characterize the church last time. As Paul had uncovered the secret of the church, had John on Patmos revealed the secret of the church on earth. Eph. 3: 4-6. Revelation. 2: 1-3: 22. But any message and Bible verse concerns us all therefore must not forget and miss something! No. 1017: Why Evangelist Finn Arne Lauvås wished I was drowned! In other words was silenced! Why Evangelist Finn Arne Lauvås wished I was drowned! In other words was silenced! Jesus was also hated by so many, so it's probably the lot in life also his followers should expect to get ?! When also the authority begins to hate a person, as we all know ourselves, that's exactly what Jesus himself said in advance would and had to happen. But we as believers, we look forward to the upcoming world and the judgment in which God will judge all these wicked and hateful people. 2 Pet. 13 Nevertheless we, according to his promise, look for new heavens and a new earth, wherein dwelleth righteousness. Can Christians be so against each other they ask me? To that I can only say, unfortunately yes! After I wrote this about Finn Arne joining as good as a believer and preacher, but today is a heretic who stands for something completely different than what he stood for before and what God's word teaches and teaches us about Israel. Now they hated Jesus - they hate me - that's exactly what Jesus did, we could expect. They get the authority on this hatred, it is just the same as Jesus experienced. Here I go in Jesus' footsteps both from experience and based on what he learned. Joh.e. 7. 7 The world can not hate you; but me it hates, because I testify about it that its works are evil. Joh.e. 15. 19 were of the world, the world would love its own; but because ye are not of the world, but I chose you out of the world, therefore the world hates you. I hated being so, it is only because I belong to God, not for any other reason. This hate to be so strong that they, inclusive think they are serving God with this hate. Joh.e. 16. 2 They will put you out of the synagogues; yes, there comes a time when whoever kills you will think that he doeth God service. 3 And these things they will do because they have not known the Father nor me. 4 But these things have I spoken unto you, that when the time comes, ye may remember that I told you; these things I said not unto you from the beginning, because I was with you. Imagine, they'll go as far as they can. And they think they serve God, but they serve and belong to Satan those who are doing such a thing! I'll try to briefly explain this, how it all happened. I and my family were on Reunion at Tromøya at Arendal in 2009 Sky and Sea with Evangelist and jester Jornstrand. When to unwind and listen to the preaching. Where was Finn Arne and taught and preached in several meetings, but it had come something new and strange in there that was not there before in his preaching. But I was positive, still against him and what he taught and preached. Photo of me Jan Kåre Christensen as unfortunately so many hate the so-called Christian when I both stand for and preach God's word clear, straight and clear! After a meeting I was and Finn Arne out to eat Pizza in Arendal, where he began to publish the strangest views up and about Israel. I was still posetivt to him, after all it was he who led me through the baptism of the Holy Spirit in which I spoke in tongues and was filled with God's Spirit. It was he who baptized me when I was 17 years old. I was 17 years old when he baptized me. This was in April 1982 and I was 18 years on August 3, later in the year. Right before I started a Bible school in Smyrna. After the meeting in Arendal so I bought ca. 10 CD of him where he teach about Israel. Then I realized that he was a replacement theologian full extent. This is nothing else than heresy from beginning to end! We sent SMS to another, and this did not Lauvås, he began writing brusquely to me. There was something between us come that was not there before. I was then on Facebook that I have not been in 5 years. Where during an exchange with other cooks it over for Lauvås. He writes something which I then reproduce freely. When I baptize you would I kept you so long under that you did not live up! I confronted him about it afterward. And he believed that the flesh seemed so strong in me that if I did not change me, so he thought what he wrote. Since then we have had no well with each other to do? It also testifies contrary Lauvås that he could not accept me as after all clung to the teaching and preaching as he once stood for himself and learned to like me one of his x disciple. Thoralf Gilbrandt and Finn Arne Lauvås had discussed this on Israel a whole day together. Want to bring a thing I remember, that think may be interesting for many. When I talked with Lauvås about his so-called new learning about Israel and the prophetic word. Then he said, inter alia, that he had shortly before Gilbrandt dead had to be with him an entire day when they "accidentally" stayed the same place when they had meetings a place here in Norway that I do not remember. Then said Lauvås that Gilbrandt stuck to the old delusions etc. he was now a man with a 'renewed' views on Israel as he ia had taken in Scotland. Talk about getting into delusion! Afterwards said Lauvås that he believed it so I was so in the flesh, that he would hold me down under the water so that my flesh had never been allowed to emerge. This shows how far he has fallen as desired with death because I contended with his unbiblical and Antichristian learn about Israel. But hate is stronger than love for many, when everything becomes then! Here are some articles about Lauvås and topic about Israel and replacement theology. No. 1016: Then Evangelist Finn Arne Lauvås taught that God had two people, I was one of his admirers and listeners! Then Evangelist Finn Arne Lauvås taught that God had two people, I was one of his admirers and listeners! I suppose I've been on a few thousand encounter in life and heard probably twice as many speakers as I've heard very much preaching to voice cassette, CD and Radio. One of the preachers that I have appreciated and liked. There is no doubt Evangelist Finn Arne Lauvås, but that was before! What Evangelist Finn Arne Lauvås preached before, when he lived with God and proclaiming the good news. 1 Exodus 22 15 And the angel called yet again to Abraham from heaven 16 and said, By myself have I sworn, saith the Lord: Because you have done this and have not withheld your only son, 17 I will greatly bless you and make your seed as the stars of heaven and as the sand on the seashore, and thy seed shall their enemies possess; 18 and in thy seed shall all the nations of the earth be blessed because you obeyed my voice. When I was new in the faith. I was saved and born again in January 1981 after this meeting I saw Finn Arne winter 81/82 and further into the spring after he moved back to Karmøy after Board deed in Bergen in the free evangelical congregation there. He became Board in a form for outpost activities into two smaller four evangelical congregations in Karmøy. In many ways, Finn Arne bit ahead of its time with systematic and thorough Bible teaching. One of his favorite themes was Israel. Here he was crisp, clear and had a wealth of knowledge and insight, I thought! Something he preached Oftentimes was he Abraham would be blessed, and this he saw in two ways. One way was for him to count the stars in the sky, like Finn Arne meant was us Gentile Christians. Then he would count sand on the seashore, as Finn Arne thought was a picture of the carnal Israel. He also taught that Israel was the future of God's people, but they stood on "Wait!" Furthermore, said Finn Arne Lauvås so I can remember it, that Israel was God in a special way to take care of. When due the promises he had made to Abraham, Isaac, Jacob and all others throughout history. He stood completely with Israel? Or was this just an excuse to be first known as a preacher, so since bringing a very hatred of Israel and since becoming a replacement theologian? Ord. 16. 18 Ahead of doom go bravado, and before a fall pride against. 18. 12 Before destruction the heart of man himself, but humility goes before honor. 29. 23. A man's pride shall bring him low, but the humble honor. Not sin, but haughtily took Lauvås. It is not only sin, immorality and all that we as believers have to fight it, but pride is as dangerous and bad. Only there are more sophisticated and it is not that open up in the day, but likewise bad there. It will lead people to destruction, just as sin does it! Why ended Lauvås up as a replacement theology and thus put themselves on "the sidelines"? It does not help to start straight, good and look like a is several steps ahead of the others when the heart is filled with arrogance and pride? No one could speak as Lauvås photos from GT, but today, what then? He wants me dead, that he had drowned me when he baptized me. Picture of a coffin, also in Jan Aage Torp want to get me and the Heavenly blog removed. Strange that so many want to see me gone? Lauvås baptized me as a youth - 17 years old - now he thinks that would drown me when I think he's been a substitute theology and heresies! Nice when he baptized me to Christ, it was a great day! But it was a sad day when the same Lauvås would drown me when I could not accept his substitute teacher. Here is some of what I've written about Lauvås, can only hope he finds back to God and begins to bless Israel. He says he is Christ theologian, but it can not be without also bless Israel, then salvation is from the Jews. Salvation in the past, present and future! Nr. 347: Evangelist Finn Arne Lauvås has stagnated preaching and gone back because of the unbiblical teachings and preaching! 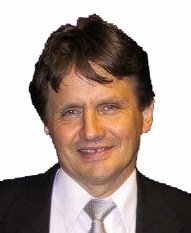 Evangelist Finn Arne Lauvås has stagnated preaching and gone back because of the unbiblical teachings and preaching! First, I will briefly explain what the Evangelist Finn Arne Lauvås learn today: It is that he has gone away from the so-called dispensation doctrine says that God has "two" people. Where Finn Arne believes that God has only "a" people who are all believers Kristi. Israel is no longer God's own people who have special promises. Ergo no 1000 year kingdom when Revelation have already been fulfilled and there will not be any trouble either for Israel or for the world. This is the great man, and you wonder what you can submit questions and you will get answers. But the shrine under your full name and real and I will not answer when I unfortunately get into too many ugly and unpolished comments, mails etc. 1) Heard on the radio Maranta a speech from their summer reunion. Unfortunately many years ago they heard from God can admit such a backslidden preacher and seduced. Incidentally Got a mail from those that I had to repent etc. and asked what from and have not received an answer yet, talk about audacity and insolence in Maran-Ata here in Oslo. Finn Arne Lauvås spoke a futile and flat message that he preached much better before. What has happened? It's gotten into something that the Bible describes as heresy. When the result is that one lives in a spiritual dry land. Psalm 68:7 God gives the solitary house, leads prisoners out of luck, just the rebellious live in a parched land. 2) Lauvås is and will remain a replacement theologian, finished work. What is it to be replacement theology? Israel in the old covenant, to be replaced by the Christian church in the new. It is the Christian church is the new people of God, the new Israel. The significance of this is that all the promises that Israel did in the old testament times, now transferred to the church. Land reform is replaced by God. The kingdom of God is meant the church here on earth and heaven in eternity. The promise of land to Abraham, Isaac and Jacob by the Lord, was obviously something tangible and concrete. But replacement theology spiritual make these promises. The historic and substance of the promises are gone and they are no longer tied to Israel, but to the church. Those who believe in Jesus as their Savior. 3) God's promises to the fleshly Israel stands. Jeremiah 31 35 Thus says the Lord, who gives the sun for light by day and the ordinances of the moon and the stars for a light by night, who rebelled ocean as its waves roar - the LORD Almighty is his name: 36 If those ordinances are in force before me, saith the LORD, then shall the offspring of Israel cease from being a nation before me for days. 37 Thus says the Lord: If the heavens above can be measured, and the foundations explored down there, I will also cast off all the seed of Israel for all that they have done, saith the Lord. It can not be said stronger? As long as the earth, sky, sun, and everything else will pass, Israel will be the Lord's chosen people, in spite of their faults. 4) The church is a parenthesis on the basis of Romans 9-11. As people are Israel today set aside while God works among all nations. Israel's enemies because they rejected Jesus. But God loved us while we were yet enemies, his love reached us while we were yet sinners (Rom. 5:8-10) Similarly, the faithless Israel loved by God - for the fathers' sake. God can not give this people and has a special plan for them. A plan that should be executed when the fulness of the Gentiles has come into the kingdom of God (Rom.11: 25) The promises He gave to Abraham, Isaac and Jacob, he regrets not. Israel will be saved and be a blessing on the earth. It will happen in their own country Israel. 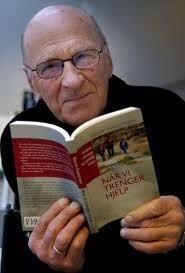 5) Lauvås preach the same year in and year out, no development and new pages. But it is not so strange when he acts both directly carnal and has begun replacement theology. 6) Find Arne Lauvås reminds me of a St. Bernard dog in the proclamation handing out some juice to a dying patient in need of a comprehensive treatment at the hospital when he has a broken back as the Norwegian Christianity has and calms down. 7) Lauvås not provide the right food at the right time. It helps not to preach Christ and God's promises etc. when people are living in sin and live at a distance. Then one must hear repentance and provoking message that grabs than in the conscience and makes you wake up. And when Christ becomes a mantra words are preaching, it's almost like listening to a New Age meeting or as the Pharisees were in Jesus' time who repeated itself ad nauseam. Christ the term dilutes Lauvås and his peers. There are followers of Jesus Christ will have, not followers and monkeys! 8) Lauvås is sacrilegious that person become and takes itself seriously while others He does not care about, it's flesh. Had a debate with Lauvås 3 years ago when he was the head could not and would not answer me regarding such Revelation 20 where it says straight out that there will be a 1,000-year kingdom of Jesus. And one year later he meant on the net during a Facebook conversation that he would have drowned me when he baptized me 30 years ago, talk about change. 9) Lauvås is a dangerous person when he has gained confidence among large parts of the Christian Norway. We read several places about such people like him in God's word. Here is a space. Rom. 16. 17 But I beseech you, brethren, to keep an eye on those who cause divisions and offenses contrary to the doctrine which you learned, and turn away from them; 18 for these serve not our Lord Jesus Christ, but their own belly, and by his sweet voice and fair speeches deceive the hearts of the simple. 10) Lauvås have an itch stick bigger and stronger than many others, and he likes to use it on the "sheep" who can not tolerate and love the truth. The Apostle Paul warned on several occasions that there would be such preachers Lauvås that began well but that will eventually end in the flesh and lead people into a spiritual darkness. Here we made many scriptures, but here's a. Acts 20. 29 I know that after my departure shall grievous wolves come in among you, not sparing the flock; 30 even among yourselves men will be perceived as leading perverse speech to persuade his disciples after him. He covers and gets away disciples after them, those who believe in Jesus. But being deceived when Lauvås is today a seducer and a person who has become arrogant and did not see his own spiritual standpoint. Notice the wording of what Paul is saying that this would happen after his death. Before that, when he and the other apostles lived had they not free playground, but it should get the one his death. Final Comment: Is there hope for change and improvement? To me appears Lauvås so because I doubt very strongly for change. And those who enjoy his preaching is not actually a notch better. But we can always be allowed to pray and hope, even King Manasseh took back to God in captivity in the great Babylonian empire! As we read, for instance, the end of 2 Kings. Ou have faith and hope that the same happens with Lauvås and the Christian Norway before it is too late. King Manasseh repented almost in the 13th hour, but even then, God was gracious as he is against all who repent, just do not pride and self-righteousness are great and have taken them completely and they are completely blinded and have hardened hearts!